If that title didn’t catch your attention, I don’t know what will. But alas, here I am, giving you a recipe that truly is …. 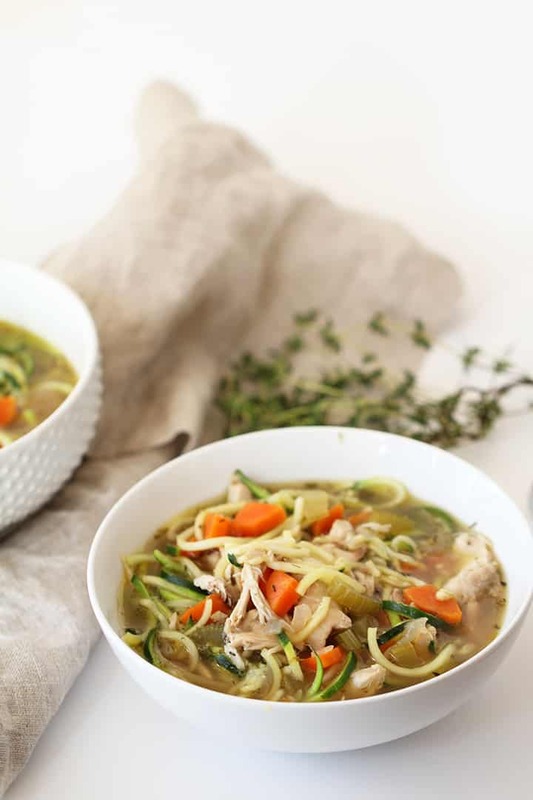 the best version of chicken zucchini noodle soup, ever! 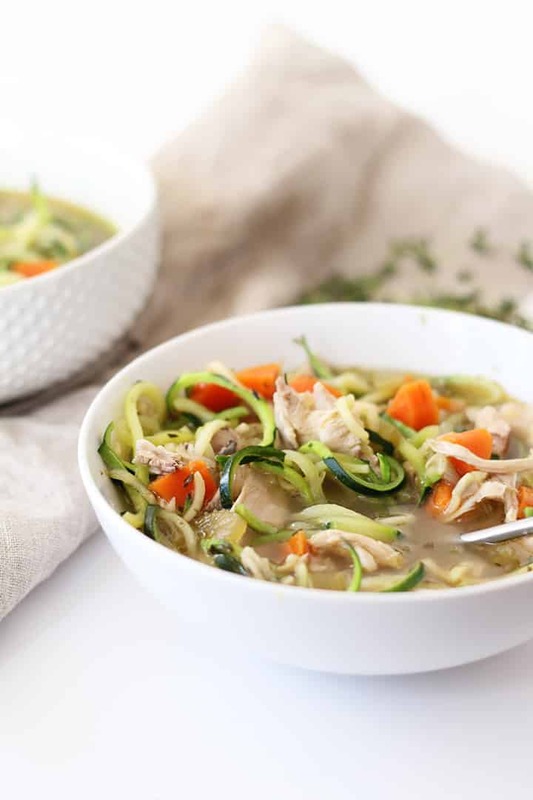 This recipe is super easy, doesn’t take too long and has that filling, comforting feeling that typically accompanies chicken noodle soup – but of course, back out the processed noodles, extra carbs and calories and swap in more nutrients from the zucchini. If you’re bored of zucchini noodles, try turnip or parsnip or carrot. You can add extra seasonings, like salt and pepper, parsley or an extra pinch of red pepper flakes for extra spiciness. 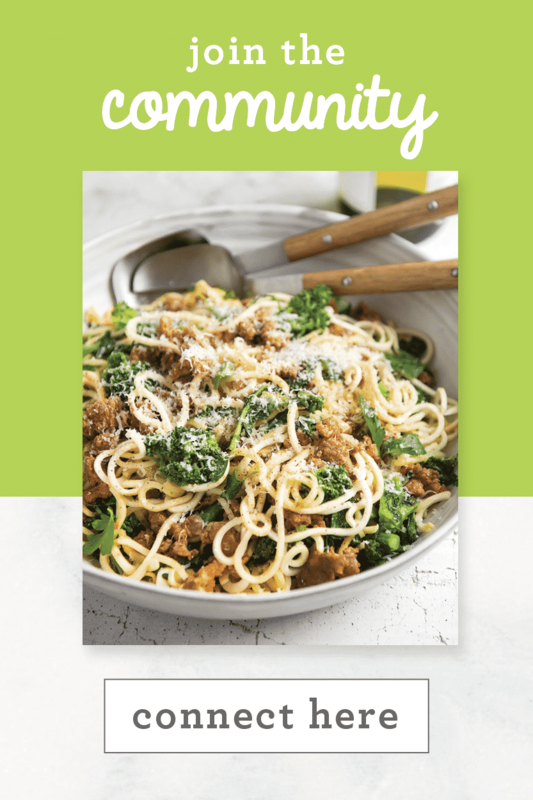 I love this recipe, because it speaks loudly to the Inspiralized movement – replace processed pasta with whole, fresh vegetables to transform your favorite classic dishes into healthier versions of the original. Lu: Hey Al, what’s up? Lu: Okay, love you. See you later. Me: Love you too. Bye! I guess you could say we’re a power couple. One day soon, I hope! 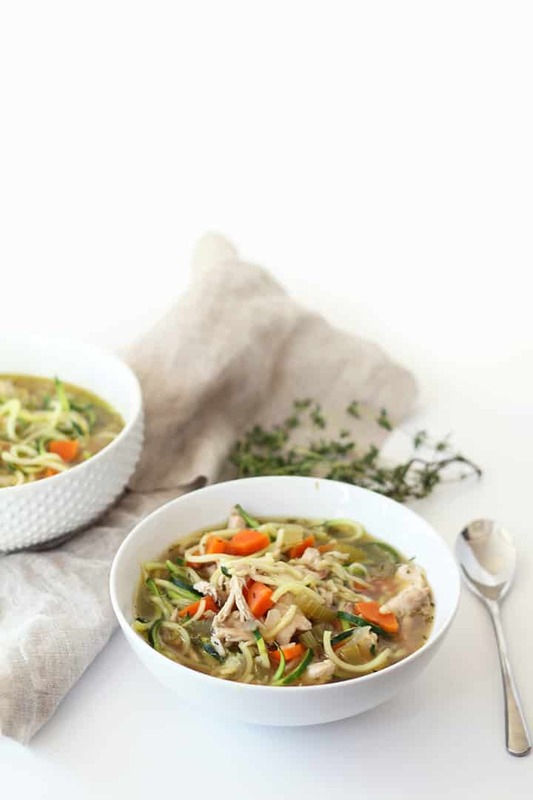 What do you think about this chicken zucchini noodle soup – it’s the best, right? Place a large soup pot over medium heat and add in the onions, celery, carrots, garlic and red pepper flakes. Cook for 3-5 minutes or until vegetables “sweat” and onions are translucent. Add in the thyme and oregano and cook for another 1 minute, stirring frequently. Place in the chicken thighs and bay leaf and pour in the chicken broth, water and cover and let come to a boil. Once boiling, lower to a steady simmer and cook for 30 minutes. After 30 minutes, remove the chicken and peel off the skin and discard. Then, shred the chicken off the bone and set aside, with any juices. Place the bones back into the soup pot and simmer for 10 more minutes, uncovered. While the bones simmer, slice the zucchinis halfway lengthwise. 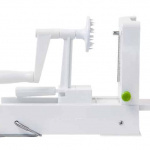 Then, spiralize them, using Blade C. Set aside. Remove the bones and bay leaves and discard. Add the reserved shredded chicken back to the pot along with the zucchini noodles. Cook for 5 minutes or until zucchini is al dente or cooked to your preference. Serve warm. Been waiting for you to post this! Can't wait to try it. How to you keep the vegetables from sticking to the bottom of the pot? I don't use nonstick, what kind of fat/oil would suggest for this? Olive oil would be best! I made one similar using roasted spaghetti squash in the crockpot and it was delicious. 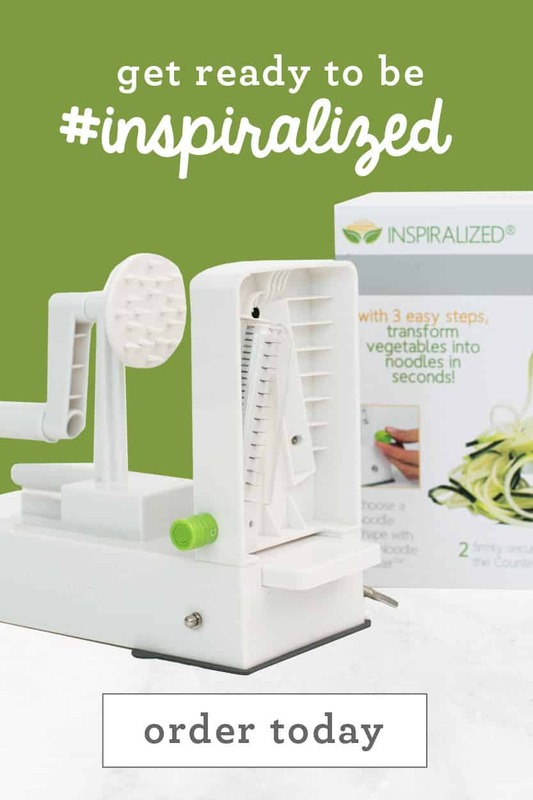 Can't wait to use my new spiralizer to try your version! I just made/ate this lunch and it was great! I used drum sticks as I couldn't find thighs,omitted the chillies for the kids and just used water (no stock). I had to add more salt/pepper due to the lack of stock. It was really tasty and perfect for this miserable rainy day! Is the protein on the nutrition information correct? It seems very very high. 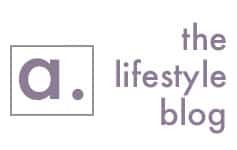 Love your website - so excited to try the recipes!!! WAY TO GO!!!!!!!!!!!!!!!!!!!!!!!!!!!!!!!!!!!!! 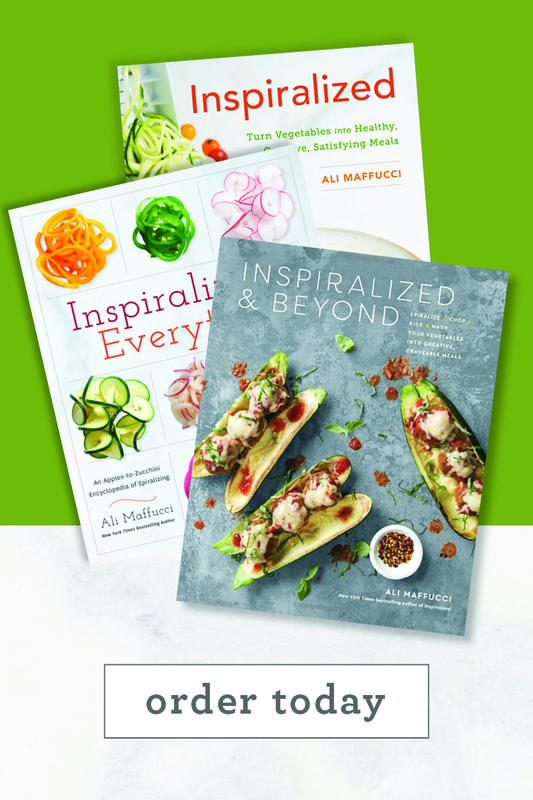 Love your recipes, Ali! For a vegan version, how much tofu would you use and how would you prepare it as a substitute for the chicken? This looks delicious , can't wait to try it. Most likely make it tonight. 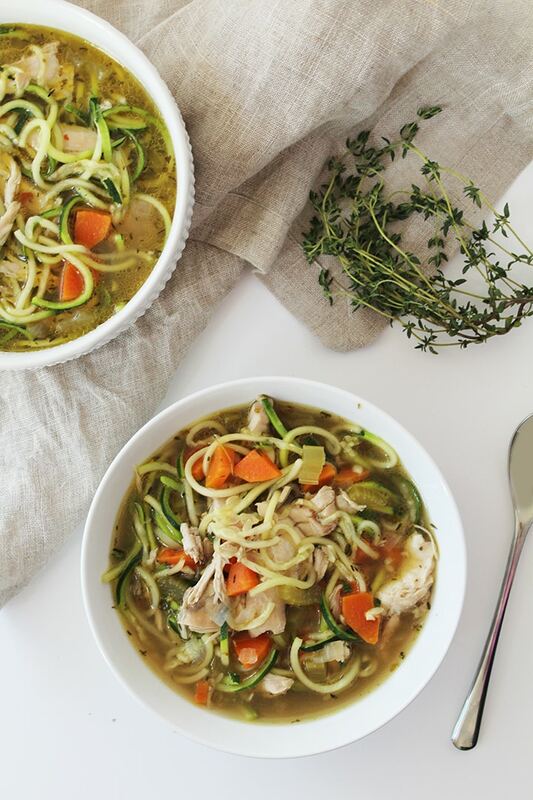 Question: Have you even had leftovers of a soup that had spiralized zucchini? Does the zucchini turn into mush? If I make a large portion of this soup for more than one day - how long can zucchini keep it's form? Because unlike root vegetables, it's mostly water. I make soup for 4-5 days from scratch (make my own broth). I have two soup recipes that use barley, and I want to replace it with zucchini. I was wondering the same thing... I usually cook on the weekend and hope to have a few portions for the rest of the week. Ali, do you have any comments? It sounds delicious anyway. Thanks Ali!! It's great for leftovers! No mushy zoodles! 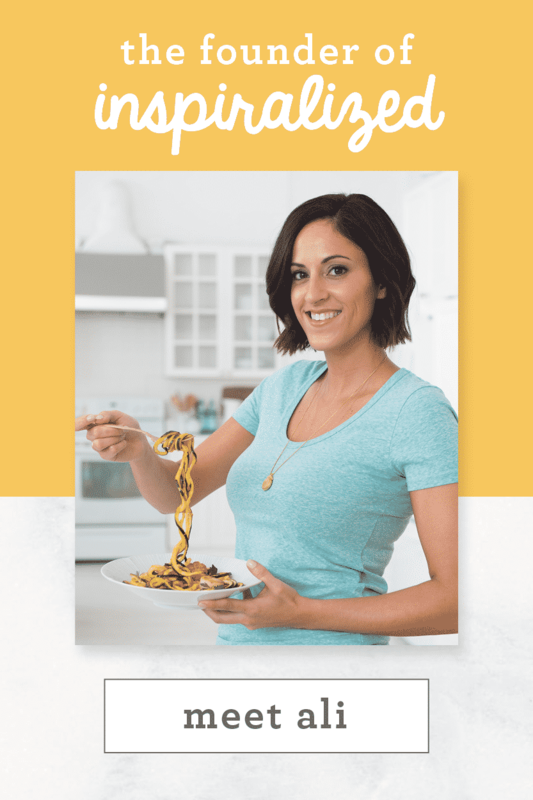 Just got a spiralizer and am so excited to try this recipe!! Thanks for sharing! Wondering the same thing-- will this soup be good leftover the next day? Or do you think the Zoodles will deteriorate? Hi! I accidentally bought boneless thighs--recommendation on how long to cook them?! You can keep the same cooking times! The bones just add flavor and nutrients to this dish! 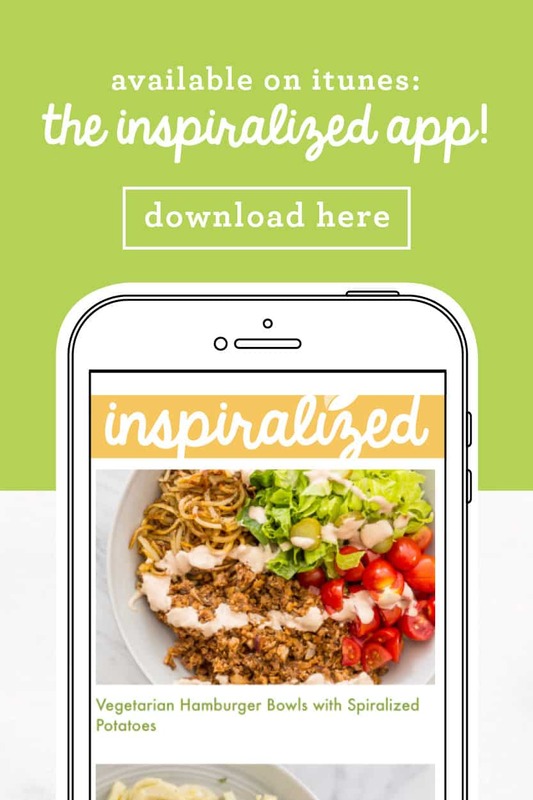 My Inspiralizer finally came! So excited to use it and this is the first recipe I made with it. Delicious! I made a double batch and used up some leftover herbed chicken breasts from the other night. My husband and I loved it! I made this as written and it was 100% delicious. (Although I did make a last minute decision to top up the chicken broth with more liquid before serving, which was a mistake. It was perfectly enough to begin with!) Definitely the nutrients and warmth I needed while I was sick. Finally got around to making this tonight. It has wonderful flavor, don't miss the regular pasta noodles at all. Already packed it up for lunch tomorrow. How would you prepare this with rotisserie chicken? Would you let just the veggies simmer for 30 minutes then add the bones, let simmer for 10 minutes and later add the chicken? Thanks! How would you make this recipe with rotisserie chicken? Would you let only the veggies cook for 30 minutes, add the bones for 10 minutes and then add the chicken? Thanks! I want to make sure I understand about preparing the zucchini. You say to cut it "halfway lengthwise." So, I will cut halfway through the zucchini (down to the seedy part) from the stem end to the blossom end prior to spiralizing? Why do we cut in half "lengthwise"? When I do that, I get very small pieces of zucchini. Don't you want longer noodles? I made this yesterday and have a few comments. First, the recipe says it makes "4 very hearty bowls." I'm not sure what the definition of "very hearty" is, but it makes about 2 1/2 quarts of soup! Since it's just 2 of us in my house, I will probably cut it in half next time. Second, I decided to use just 2 zucchini. That made more than enough zoodles for me. Thirs, I made this yesterday to have for lunch today. I wish I'd waited to add the zoodles today, as they pretty much disintegrated over night. Next time, I may use the larger blade and not cut the zucchini down the center before spiralizing, then just cut them into smaller lengths by hand. And finally, the soup was full of yumminess! Very flavorful! Thank you so much for your comments, Rita!! We're glad you liked it. 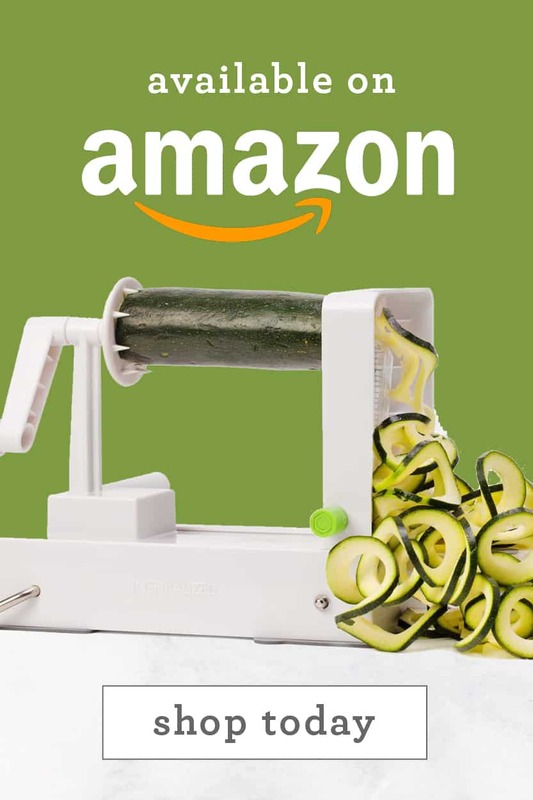 I agree, the zoodles can deteriorate the next day. Ali, this soup is AMAZINGLY DELICIOUS!! 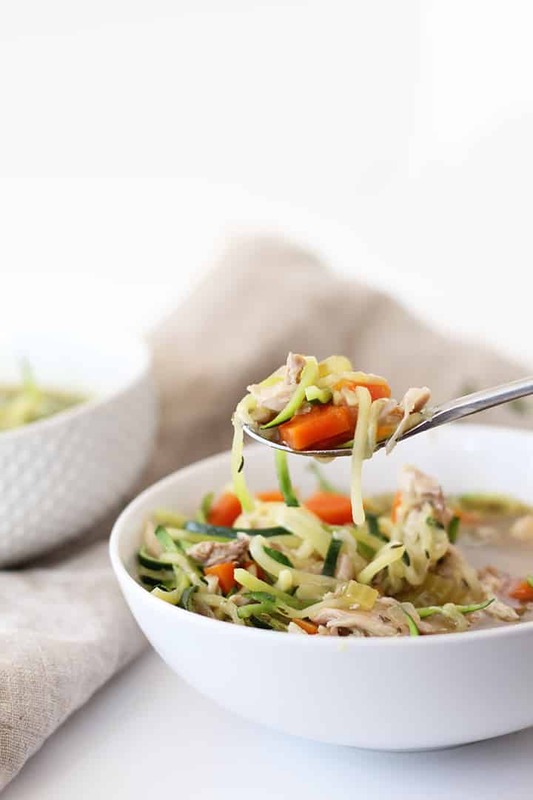 I have a cold and went grain-free recently, and needed some chicken soup, so busted out my spiralizer. I will have this as my g-to from now on! The chicken thighs, vs. breasts was spot-on, so much flavor, and also, with the bones and skin on at first. Thank you for this delicious "medicine" for when I am sick, or healthy! Absolutely delicious! :) and the zoodels didn't turn into mush even after three days. Will definitely make it again! Can you make in crockPot? If so, how?! Maybe do vegetables at the end? Made this tonight- perfect and quick after a long day of cross-country skiing. I made some replacements. Instead of low sodium chicken broth, I used no salt added (you can buy it at any grocery store). I also didn't add the celery, but one more carrot. I used chicken breast (3 of them) and simmered for 25 minutes, took them out, shredded them, and then put them back in for 5 minutes before adding the zoodles. Turned out really yummy! Does this keep well? Or should I separate the zoodles and only add them in right before eating? Can I substitute bone in breast? Hi Joyce! Yes sounds delicious! It looks yummy! My kids loves noodle soup, Whenever we go out and look for a place to eat, they always say "mom we want the best noodle soup ever", and you got me! :) I will do this over the weekend. Do the zoodles get mushy when you freeze them? I want to make a huge pot of this but am concerned about how it will keep.